NEW YORK, NY — Following nearly three hours of compelling, wrangling, and heartfelt deliberations, author and filmmaker Dinesh D’Souza was sentenced on Tuesday to five years of probation. He will serve the first eight months in a community confinement center, as deemed by Judge Richard Berman in the United States District Court of the Southern District of New York. Brafman cited several similar cases during D’Souza’s sentencing in the federal courtroom, none of which ended in jail time. Brafman posited that a punishment of incarceration did not fit the crime for which D’Souza was being judged. In the end, Judge Berman agreed. Judge Berman also took into consideration the fact that this was the 53-year-old D’Souza’s first offense. D’Souza was indicted by a federal grand jury in the beginning of this year for making straw donations – contributions in the names of other people – to a Republican Senatorial candidate running in the State of New York, Wendy E. Long – a move that is violation of federal campaign finance laws. D’Souza had, through two friends, donated $20,000 to Long’s campaign, an amount which exceeds the $5,000 legal limit. In addition to his five-year probation sentencing and eight months of confinement in a community confinement center — or restitution center, which will likely be completed in San Diego, California where D’Souza resides — Judge Berman ordered D’Souza to undergo “therapeutic counseling.” Berman also noted that during those five years, D’Souza must carry out community service by teaching English as a Second Language (ESL) for eight hours a day, one day a week. 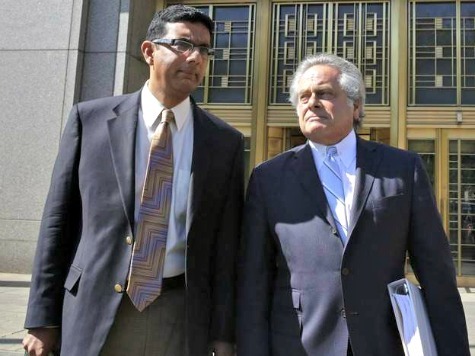 Attorney Michael Gaynor, who was present at D’Souza’s hearing as a spectator, told Breitbart News that “Dinesh D’Souza does not belong in jail.” He also pointed out that he had never heard a judge sentence a defendant to therapeutic counseling. Judge Berman also ruled that D’Souza must pay a $30,000 fine within 45 days. Berman, 71, was appointed to the court by President Bill Clinton. Brafman rebutted that D’Souza’s act was carried out “without premeditation” and noted that, if he had planned out said action, the $25K his client had withdrawn in one lump sum from his bank would have, in fact, been drawn out in increments of “under $10k at a time” in order to avoid a currency transaction report (CTR). Thus, Brafman argued that D’Souza did not act in a manner that was premeditated. D’Souza admitted that, in the interest of time, he had not consulted attorneys in his decision to donate to Long’s campaign in the way he did nor did he create a political action committee (PAC). D’Souza, who is known for such documentary films as 2016: Obama’s America (released in 2012) and America: Imagine a World Without Her, which hit theaters this year, is due back in court on October 15 for the finalization of details of his sentencing.